KEITH OLBERMANN: Which of these stories will you be talking about tomorrow? Why does President Bush hate American kids? DANA PERINO, White House Press Secretary: We won this round on SCHIP. OLBERMANN: But what did the lame-duck President win today? Even some Republicans have kids and don't have insurance. And as for Democrats, Mr. Stark of California lives up to his name. Rep. PETE STARK (D-CA): You don't have money to fund the war or children, but you're going to spend it to blow up innocent people if we can get enough kids to grow old enough for you to send to Iraq to get their heads blown off for the President's amusement. Olbermann opened the show charging that the President is "bankrupt" because his spokesperson, Dana Perino, had characterized "denying roughly four million children health care insurance" as being a "win" for the President. Olbermann: "Are wins really that vital to this White House? Are they so few and far between that a President who threw away the greatest personal support ever afforded a chief executive in this country, and threw away a reelection, is so marginalized that he would have a spokesperson characterize denying roughly four million children health care insurance as, quote, 'We won this round on SCHIP'? Our fifth story on the Countdown: Yes, George W. Bush is that bankrupt." 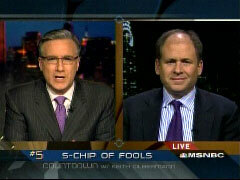 The words "SCHIP of Fools" appeared at the bottom of the screen and remained for most of the first segment. The MSNBC host soon cited a CBS News poll showing that the vast majority of Americans believe SCHIP should be expanded "the way Democrats want it," without mentioning a recent USA Today poll which found that most Americans oppose the plan when told of the specifics. After playing a clip of House Speaker Nancy Pelosi complaining that the cost of insuring millions of children would only be a fraction of the cost of conducting the war in Iraq, Olbermann replayed the clip of Stark's inflammatory comments about President Bush. After mentioning that House Republican Leader John Boehner had called on Stark to apologize, Olbermann read Stark's defiant response in which the Democratic Congressman refused to apologize and attacked Bush again. He soon brought aboard Newsweek's Jonathan Alter for further discussion and, after a while, asked Alter about Pelosi's words and conveyed his view that "it would seem like that's a slogan that's a winner." During his response, Alter opined that while Pelosi may be on the right track, that Stark's original comments were "pretty stupid." Then, while acknowledging that Stark's words were "extreme," Olbermann seemed to admire the Democratic Congressman's unwillingness to apologize as he asked if it was "refreshing." Alter, who normally agrees with Olbermann's comments, couldn't agree with this one as he contended that Stark "should back down" because his words were "silly and counterproductive." OLBERMANN: And yet, did you not, in that, obviously he went to extremes there, but was there not something refreshing about his at least refusal to back down when somebody came after him? Or is the Democratic leadership going to say to him, "No, you're going to have to back down to some degree"? ALTER: No, I think he should back down. I mean, you've got to look at the way, say, Pelosi handles it, versus the way, you know, Stark handles it. You can't say, look, the President is misguided, he's been a terrible President, but he's a human being, and he doesn't like to see people killed, and to say that he does is just silly and counterproductive, and the best thing for him to do would be to apologize and move on. KEITH OLBERMANN, in opening teaser: Which of these stories will you be talking about tomorrow? Why does President Bush hate American kids? OLBERMANN: Good evening from New York. Are wins really that vital to this White House? Are they so few and far between that a President who threw away the greatest personal support ever afforded a chief executive in this country, and threw away a reelection, is so marginalized that he would have a spokesperson characterize denying roughly four million children health care insurance as, quote, "We won this round on SCHIP"? Our fifth story on the "Countdown": Yes, George W. Bush is that bankrupt. PERINO, after explaining why she believes the veto would strengthen Republicans: I think that that bodes well for Republicans. OLBERMANN: You want to put that to a vote? Except when it clearly does not bode well for Republicans. According to a new poll from CBS News, 81 percent of Americans in favor of expanding SCHIP the way the Democrats want it, 74 percent of those in favor are willing to pay more taxes in order to fund it. The Democratic leadership pointing out there is also another perfectly acceptable funding source. NANCY PELOSI: And if the President is saying we can't afford the bill, then I would just say and remind that for 40 days in Iraq, we can insure 10 million children for one year in America. OLBERMANN: Ms. Pelosi giving the measured kind of soundbite that made her Speaker of the House. In contrast, the Democrat Pete Stark of California taking the Iraq analogy and turning it up to 11. 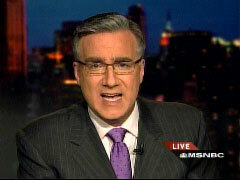 OLBERMANN: With that comment, Congressman Stark becoming the story today. Minority Leader Boehner calling for Mr. Stark to retract his statement and issue an apology. Instead of doing that, Mr. Stark issued another criticism of Mr. Boehner. Quoting from his statement, "I have nothing but respect for our brave men and women in uniform and wish them the very best, but I respect neither the Commander-in-Chief who keeps them in harms way nor the chicken hawks in Congress who vote to deny children health care." OLBERMANN: Did the Democrats finally find some actual tack of use politically here, the Pelosi line that 40 days in Iraq would pay for a year of the fully funded SCHIP. I mean, you know, saving kids' lives, versus taking the lives of slightly older kids in Iraq. It would seem like that's a slogan that's a winner. JONATHAN ALTER: Yeah, you know, Iraq dollars are actually a pretty good way of measuring misplaced priorities. When you're at $9 billion a month, that's real money. And you can explain it to the American people, you know, what we're not getting. And it's pretty hard to argue that something is too expensive, especially for kids, when you're spending that kind of money on Iraq. But at the same time, you know, for Pete Stark to go off and say the President likes to see people killed for his own amusement, is pretty stupid, and it's the kind of thing that, you know, causes Democrats problems that they should otherwise be able to avoid.